Although the public sector remains the main source of infrastructure funding, the market value of infrastructure assets grew by 300 percent over the years 2007-2014. Can private funding be the answer to the growing infrastructure financing gap? The broad spectrum of infrastructure assets consists of transportation, telecommunications and technology, energy, social infrastructure, resources and waste management. Each of these clusters can be broken down into smaller segments which we all know and use on a daily basis. A phone to call friends, a train to commute to work, or the electricity to light up a house… Sounds familiar? Sure it does. When it comes to infrastructure, the world is divided into two groups. The developed world is highly saturated with infrastructure; therefore its focus remains on maintaining and modernizing the existing facilities. Developing countries, on the other hand, continue to struggle with satisfying basic human needs, and what is in the center of their attention is constructing brand new public works. Despite what the main goal is – to maintain or to construct – infrastructure demands constant and heavy investment. 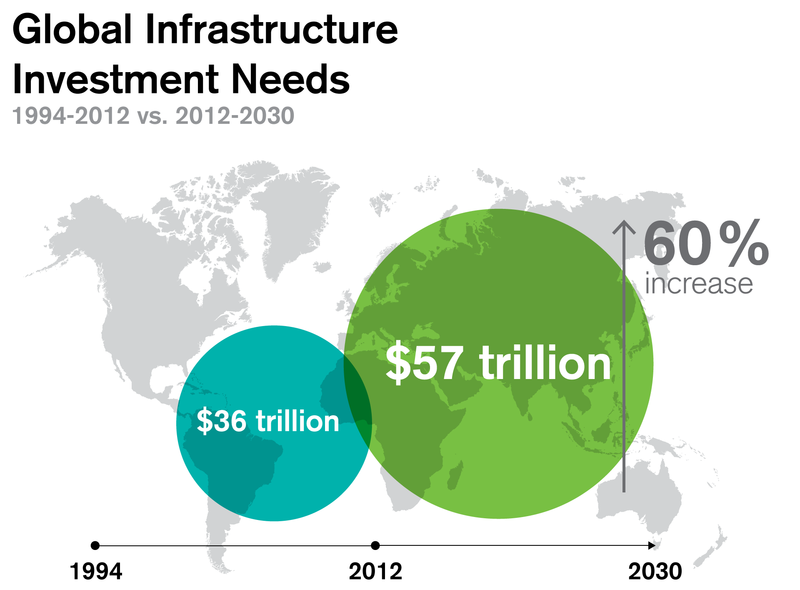 As estimated by McKinsey, just keeping up with projected global GDP growth of 3.5 percent will require investing around 57 trillion dollars in infrastructure by 2030. A tough task, especially when global infrastructure needs exceed financial possibilities of governments. Reasons for the continuously growing infrastructure investment gap include the repercussions of the financial crisis, demographic changes (mainly ageing population), urbanization and migration as well as environmental issues, such as climate change. What is needed are novel ways of financing new and existing infrastructure. Private funding could be one option. According to Preqin, an agency that analyzes alternative assets, in 2014 global infrastructure assets under management in unlisted funds reached a record high of 282 billion dollars ‒ three times more than seven years earlier, in the pre-crisis world. Institutional investors such as insurers and pension funds with long-term liabilities, encouraged by the low interest rates, are 'enriching' their portfolios with infrastructure assets. The long life of these assets is a good match for their long-term liabilities. And what makes investing in infrastructure attractive are relatively stable cash flows, protection against inflation, low volatility and returns which are generally not correlated with other assets. Investing in infrastructure is not for everyone. High entry barriers and specific risks make it an exclusive investment group. Robert Parker, Credit Suisse Senior Advisor, in his article "Infrastructure on the Rise" published in Global Investor 1.15, points out the main risks associated with infrastructure investments. For new projects, the obvious risk is that projects are either not finished or have significant delays and cost overruns. What all investors need to keep in mind are political risks, environmental issues, and the threat from newer technology. Despite the risks, an increased private sector involvement in developing infrastructure seems inevitable. Firstly, it is an attractive option for investors looking for long-term assets. Secondly, due to the growing infrastructure financing gap, these investors can usually count on the support of governments and supranational authorities. The private side should benefit from the stability of projects that are relatively immune to short-term market trends, while the public side should benefit from the additional financial means and know-how. When planned and executed well, private-public cooperation can be a win-win situation for all. The construction of the onshore wind farm cluster located in central Norway has started in the second quarter of 2016. Once up and running in 2020, it is expected to be the largest onshore wind farm in Europe and should produce enough energy to meet the electricity needs of circa 170,000 Norwegian households. Fosen Vind DA, the project's owner, is a joint venture consisting of: state-owned Statkraft (52.1 percent), a regional energy company owned by local municipalities ‒ TrønderEnergi (7.9 percent), and a European consortium created and led by Credit Suisse Energy Infrastructure Partners (40 percent). Dominik Bollier, Managing Partner at Credit Suisse Energy Infrastructure Partners, comments: "The project has been structured in order to facilitate a symbiotic co-existence of industrial and financial investors in the same investment and hence made an attractive investment accessible to financial investors in the first place."